All photos & descriptions are copyright protected. We kindly ask that you do not copy our photos by any method for any reason. Not for use on Pinterest, blogs, etc. Fabric Covered Boxes! Perfect for storing your needlework supplies! Just prim enough! Perfectly aged time-worn fabric edges! Store buttons, lace, and all sorts of things! Set of 3 Graduated Sizes: 5" x 4", 4.5" x 3.5" & 3.75" x 3"
$29.95 for all 3! While supplies last! 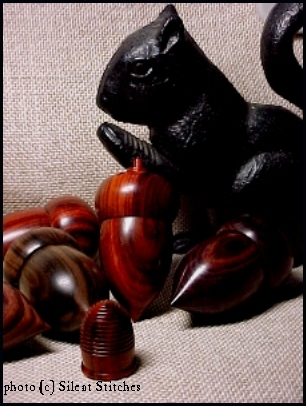 Each piece is hand turned of beautiful dark hardwood. 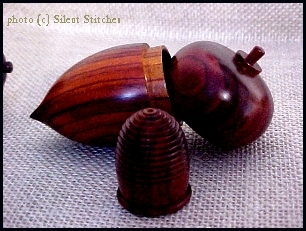 The Beehive top opens to reveal a matching beehive thimble & double spool. Also inside is a place to store your pins & needles. The pin cushion is hand turned and has a lovely velvet pin cushion. The tape measure extends to 36" and has a turning center post to rewind the tape. Overall, the beehive huswife is about 3" tall by 2" wide. Sold out until further notice...thank you for your orders. $49.95 set Sold out. Thank you. In our humble opinion...one of the loveliest lucets we've ever seen! Click here to see the LUCET BRAIDING instructional book on our books page. 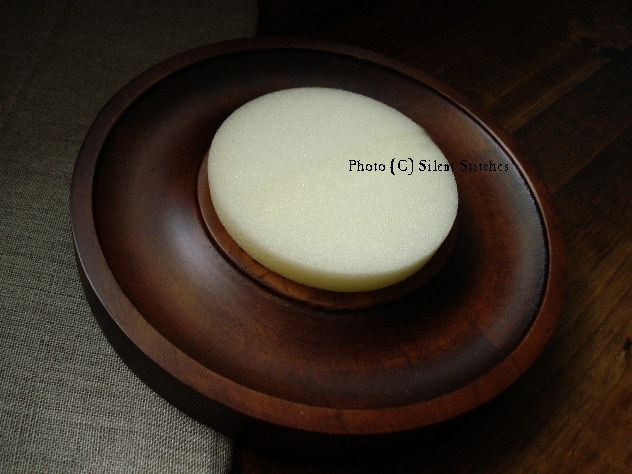 We also have a plain design wooden Lucet available. 3 sections to keep you organized! There may be less expensive carriers being made elsewhere. They do not compare in quality, craftsmanship and materials. If you want the very best.... here it is! No, you don't have to be a naked needleworker to own this carrier! By "naked" we only mean that this carrier is unfinished/unpainted! You may decorate, paint or stain it any color of your choice! Handcrafted in the USA by the same gentleman who makes our other carriers. Made of selected Poplar and traditional copper tacks. Sturdy & heavy and made to last for generations. Measurements approximately: 12.5" x 8.5" Center divided, giving you 2 sections for organizing. Removable foam insert, ready for you to design your 3.5" round pin cushion! Overall: Diameter 7.5" Height 3/4"
See photo below for design ideas. Includes: Foam topped cardboard for mounting your fabric/needlework. Overall size: 4" x 3" x 2" ~ Design Area: 2" x 3"
Removable top lifts to reveal a secret storage compartment! Exquisite Treasure Boxes. Add a photo or needlework. Explore your creativity to make these extra special! Each hinged cover has an interior clip which holds the backing board below the glass top. Fully lined black velveteen interior and underside. Made in China. 5 style choices. Please click on each of the photos below to enlarge for better viewing. 3 5/8" x 4 1/2" x 1 7/8"
Design Area: 2"x 2 7/8"
Design Area: 2" x 2 7/8"
Design Area: 2" x 2.7/8"
Lathe turned. Smooth rounded handle with a tapered end. Tool for winding a center-pull ball of yarn! "Nostepinne" Scandinavian word meaning:"nest stick"
A great place to store your sewing/stitching essentials! Would also be a perfect desk accessory. Plenty of room for holding pens, pencils, paper clips, etc. Endless storage possibilities. Or...just display it & enjoy! These are hand-painted designs will be like the photo above but may vary slightly. Made especially for Silent Stitches! Don't you just love the fresh, clean scent of honey? This LARGE 1 oz. bar, will last a loooong time! 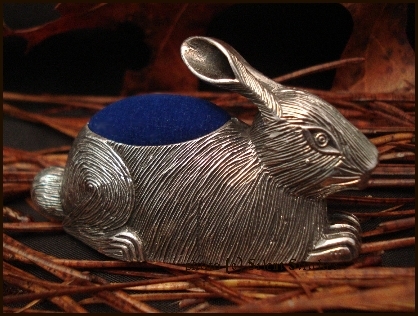 *Make it extra Special* Order one of our "Beeswax Gift Packages"
A 100% Beeswax Bunny born from an antique tin mold. For thread waxing or display. Custom Made. Please allow extra time. 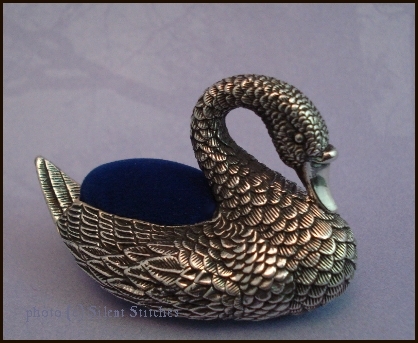 Victorian Ladies loved to have special novelty sewing accessories in their sewing baskets. an antique thread-waxer in our collection. 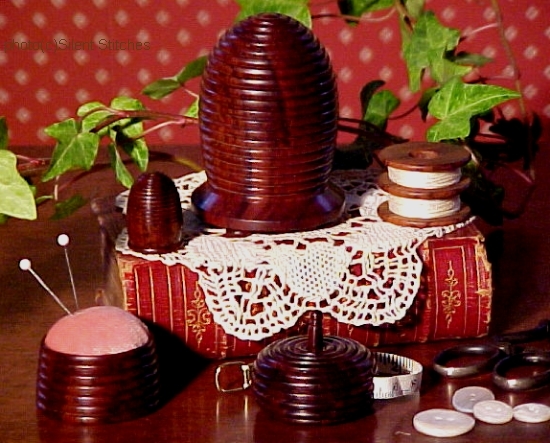 Fine for waxing your needlework threads or for display in your "Victorian" Sewing basket. Handmade of *tinted beeswax, with metal leaves cap & a matching tassel. Handmade of *tinted beeswax, with metal cap & a matching tassel. 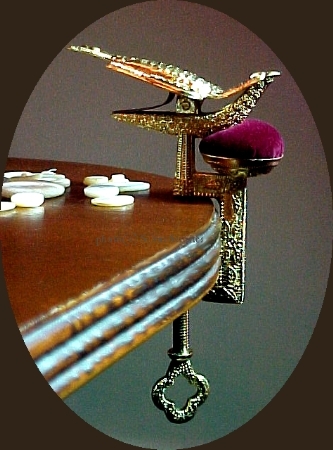 The sewing bird or sewing clamp was a popular sewing accessory in the late 19th Century. It was also known as a hemming clamp. The bird's beak opens to hold the fabric by depressing the tail. This sewing bird is a replica of an elaborate design made for Marshall Field Company of Chicago in the 1890's. Measurements approximately: 3" w x 4 1/2"
Although functional, we recommend this item for decorative use. Perfect for traveling! Great gift!  Antique brass finish, quality construction. Angled bent nose for precision. Use to pick up even the smallest beads easily! Remove stitching "mistakes" quickly & efficiently! Handy to have in your crafting basket! Easily used by Lefties too! See the matching scissors set at the bottom of the Scissors Page. 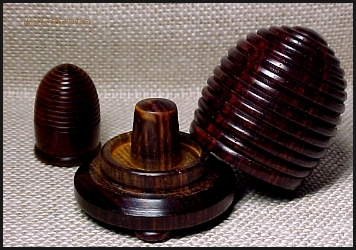 Made in India from various hardwoods. Close-up photos shown below. Average Overall Length is 5"-5.5"
A handled gadget for pulling threads through fabric. Keep the back side of your needlework neat & tidy with this handy tool! Lobster clasp allows separate use of tools. See the matching pieces available above and below. 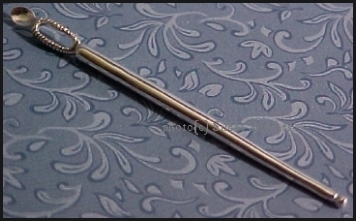 Blunt end, perfect for use with all thread types including: wool, ribbon, flat braids, etc. See the matching laying tool available above. Shaker Poplarware Needle Books are back at Silent Stitches! Expertly hand-crafted using the same techniques perfected by the Shakers. These were made especially for us! Woven poplar covers, 4 flannel pages inside to hold your needles safely. Tied together with a ribbon! Keep one in your stitching basket! Also makes a well received gift. Very study and heavy for it's size! Petite 2 3/8" x 3/8"
Looks like a treasured antique! 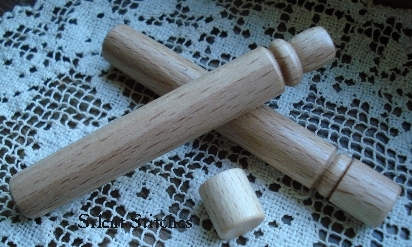 Suggested for needles up to 2.5"
Styles & wood may vary slightly, but will be similar to the one shown. Use as is...or have fun decorating with paint, beads, etc.! Artistic interpretations, expect variations & imperfections...no two alike! Perfect for needle storage...or earrings on your nightstand etc.! Turned Rosewood Crochet Hook 7"
Unique design with flattened mid-section for holding comfort. Overall Lengths: 3", 3.5" & 4"
2 3/4", Sterling Silver. Decorative eye and blunt tip. 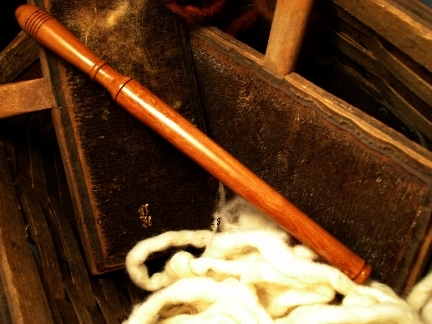 A 17th Century reproduction of one of the earliest forms of needlework implements. Bodkins were used for threading cord, ribbon or lace. The ear-spoon was used to remove ear-wax which could then be used for waxing thread & would glide easily through fabric! Adorable Sterling Silver Tatting Shuttle Charm. Perfect on a charm bracelet or chain. Buy 2 to make earrings! This charm design was inspired by an antique tatting shuttle. A must-have for your sewing basket! 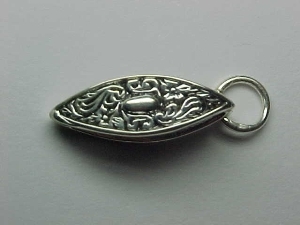 This exquisite silver threader actually conceals a dime-store variety threader inside! Should your wire ever break it can easily be replaced with a new one! Just slide it in through an opening in the top! Very clever! We especially like tucking these in a card...as a little token gift for a special friend. 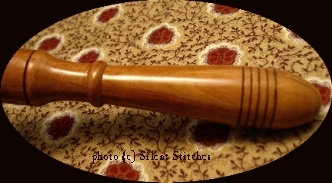 Reproduction of an antique needle case. 3.5" x 1/2". Slender profile. Hanging ring at the top. Pulls apart for needle storage. 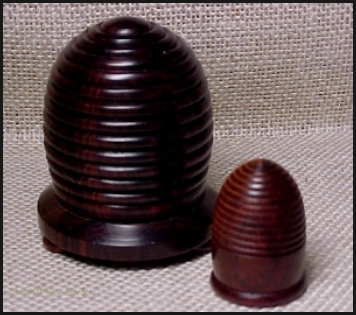 Reproduction of an antique thimble case. It measures 1" tall x 7/8" wide. Hinged top. Hanging ring on the side. Center thimble post. Past offerings....gone but not forgotten. Filigree Bone Needle Case with Black Finial Top 4"
Falcon & Floral Hand-Carved Bone Needle Case 4"
Designs may vary slightly due to each artist's interpretation.